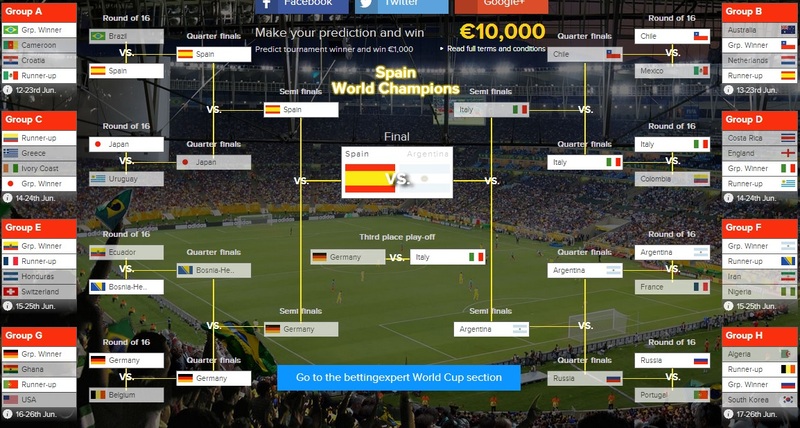 Don’t forget to head over to the Betting Expert World Cup Predictor page to create your own set of World Cup results! It’s hard to see this tournament producing the number of shocks that defined the 2002 World Cup, but the football will be significantly better than what was offered in South Africa four years ago. No big casualties in the first round – unless you count England among them – before Italy are knocked out by Japan in the last 16. Colombia and Uruguay will play out a modern-day classic, decided by a clearly unfit Falcao’s miss in the penalty shootout. Belgium will be the surprise package – not in terms of talent, everyone knows they’re good – but they’ll back it up with the scalps of Ronaldo and Messi along the way, with Argentina crashing out at the quarters for the fourth time in the past five tournaments. A resurgent France will also reach the semi-finals, forcing the resignation of Germany coach Joachim Loew along the way. Ultimately it will be Spain, again; not only have they the winning know-how but they’ve now got the right amount of fresh, young players entering their setup, meaning that any chances of them going stale – as they did in the Confederations Cup 2013 – will not come to pass. They’ll edge out hosts Brazil in the final, with Neymar’s no-show prompting a host of conspiracy theories. Like using a calculator to solve sums your school-bound mind would once have trounced on auto-pilot, I saved myself from expending the brain power required to predict a raft of group stage results in my head and instead used the Telegraph’s match-by-match predictor to decide who advanced. This threw up some interesting if lamentable results. Croatia and Cameroon both lost out to Mexico in Group A. Group B and Group C were won by relative underdogs in Chile and Japan, knocking out The Netherlands and Ivory Coast respectively and causing Spain and Colombia to finish runners-up. Normal, rather more realistic service resumed in Group D as England lost out to Italy and Uruguay, while my bizarro logic rubbed off on Ecuador in Group E just enough to see them pip France to first place, denying the Swiss a place in the Round of 16. Of the results that were left, perhaps Bosnia and Herzegovina making the cut in Group F and Russia winning Group H ahead of Belgium—thanks to some Fabio Capello managerial magic—were the only two remaining surprises, but more were to come in the knock out stages. Having come in second behind Chile, Spain had to overcome Brazil in the second round, overcoming the host nation by virtue of not being as knackered as they were at the end of the Confederations Cup, and Diego Costa entering into peak troll mode to eviscerate his country of birth. Chile’s victory over Mexico confirmed Group B’s dominance over Group A, and could well be one of the games of the tournament if this fixture were to come about in the summer. Japan overcame Uruguay’s defensive foundation and individual attacking stars through their industrious and technically astute team work while Italy parried Colombia’s thrusts and picked them to pieces. In the battle of the unexpected second rounders, Bosnia won out over Ecuador. A rather beautifully balanced final three games concluded the Round of 16, with Argentina proving their quality against France, Germany blowing Belgium’s hype-train off its tracks, and Russia nullifying Cristiano Ronaldo to progress. In the quarters, Spain proved too much for the tournament’s surprise package, Japan, while Italy disarmed Jorge Sampaoli’s Chile with a few of Cesare Prandelli’s own tactical masterstrokes. Elsewhere, Germany triumphed over Bosnia while Lionel Messi & Co. proved to be too much for even Capello to make adequate provisions for, casting Argentina up against Italy in the semis, who they were able to overpower to make the final. Meanwhile, Spain continued their impressive run of results against Germany in recent major tournaments, exhausting Jogi Low’s athletically charged team in the Brazilian heat with their maddening hogging of the ball. Fittingly, following a season that saw Atletico Madrid’s Argentinian manager challenge the established order of Spanish club football—both in La Liga and in Europe—my 2014 World Cup final pits Diego Simeone’s compatriots against a number of his own players, blended with the stalwarts of Real Madrid and Barcelona. Unfortunately, the narrative doesn’t hold out. Xavi is able to start the game, after being rested for much of the tournament, and helps to lead La Furia to another title-winning performance, keeping Messi from having the ball and or winning the trophy that he requires more than any other to secure his legacy. Spain have done the quadruple! England will reach the dizzying heights of the Quarter Finals, beating Japan to get there – though, having seen some of the fine football Japan play, I’m not sure if this is blind patriotism or not. Ultimately, England’s historic “player-injured-before-major-tournament” curse will hold them back, with stars like David Beckham before Korea/Japan and Wayne Rooney in Germany joined by, er, Phil Jones in 2014. Unfortunately we’ll crash out to Brazil, who will in-turn buckle like a hastily-made stadium under the pressure to Germany in the Semis, before Argentina defeat them in the Final to carry on the record of no European team winning a World Cup in South America. Other predictions include riots, handshake controversy and obviously something Luis Suarez-based, but there’s a time and a place. I can’t say I deviated too much from conventional thought with my predictions. The only real surprise is probably Greece topping their group, and that was based more on their reputation as stubborn bastards who usually do well under pressure than any knowledge or insight. As far as potential winners go, it’s hard to bet against Spain. Argentina and Germany can’t or simply won’t defend, Brazil have relatively poor forward options, while Italy, Portugal and France don’t have enough the requisite quality equally spread throughout their squads to inspire confidence in their respective pushes. Spain’s group stage draw is tough and their route to the final even tougher, but the squad is still by a distance the best around. The defence is as good as ever, reports of Xavi Hernández’s demise are greatly exaggerated and with Diego Costa up front instead of Fernando Torres, Álvaro Negredo or Roberto Soldado, goals should not be hard to come by. Their pummelling at the hands of Brazil in the Confederations Cup Final did have an epochal feel about it, but the champions have all the experience required to put such trauma behind them and retain their crown. One other prediction: Messi will deliver. When I first started this, I had a set of things I expected to happen in mind; the South American sides to dominate, England to flop, Europe to exhaust itself in the heat and Spain to not win. But, in the true spirit of trying to recreate the World Cup, I took it one game at a time and was surprised by the long term results. Brazil could crack under the pressure and the holes in their squad, a youthful counter attacking England catching a lucky win before a horrible, cynical and clichéd encounter with a Germany who retain the ball better ends in a schooling. Spain play out an open and exhilarating game with Uruguay worthy of a final itself, before a tenser affair with an Argentina misfiring and struggling to feed its forward line. In the final itself I envisage Germany over-experimenting whilst Spain go back to basics, get the possession game right and leave the Klopp generation’s dream in tatters. No golden boot for an exhausted Costa though, possibly a fresher Aguero taking advantage of their easy draw. There is something treacherous about making predictions for the World Cup. Aside from technical concerns which make it a different prospect to more frequent, club-based competitions, I find that being confronted by an expectant online cup bracket brings out the rationalist in me. I put it down to a worrying lack of imagination on my part, or perhaps of any human spirit whatsoever. Groups A and B yield obvious winners in Brazil and Spain, whilst runners-up Croatia and Chile present tough but manageable first round matches. Spain-Croatia was an excellent game at the euros, with Modric playing a blinder, and I can see it being a treat this time around as well; meanwhile, Chile’s dynamism and technique should give Brazil’s midfield a scare. In the case of England, I’m running off of a combination of gut feeling and a mildly optimistic outlook which sees their squad resources capable of avoiding savagings and squeezing past a Uruguay team with a creaking spine and a dazzling but slightly fragile Japan side (depending which of our younger, more technical players are involved in the latter it could be thrilling, end-to-end stuff). Italy have what it takes to get past Colombia, whose group could be very tight. France have it disgracefully easy, and I would back their talent as sufficient to get past whichever of Bosnia (picked on preference) and Nigeria finish after Argentina in Group F. Similarly, Argentina have more than enough to deal with whichever side make it out of Group E – Switzerland are good, but not good enough. I could see Group G having some great matches but pointswise being comparatively boring, with Germany and Portugal split narrowly. Portugal coming second sets them up in a loseable encounter with whoever tops Group H (an intriguingly balanced group, more so than C to my mind), but I have a feeling that this will be Ronaldo’s tournament and that will be that. Germany are too complete for South Korea or Russia; against Belgium, things might get interesting. England will get tonked by Brazil (if they make it that far), Spain will quietly choke Italy as they do most strong sides, whereas the rest of the last eight will offer a more appealing fare. I’m going for Portugal’s tighter team unit over Argentina’s superior attacking talent (something something Ronaldo blah blah Messi blah who will win something blah FIFA), whilst Germany will probably deal with France barring a virtuoso individual performance (I’m thinking back to Balotelli at the Euros, and in a different way, I can envisage Pogba running train on them, given Schweinsteiger and Khedira’s shortness on fitness/form). The semi-finals will rest on two individuals: Ronaldo and Neymar. After his first season in Europe, Neymar seems to me less ideally placed to shine than he was a year ago, and I think Germany probably have the necessary blend of power and technique to handle Brazil, although their lack of an outstanding individual match-winner like Neymar could cost them. The thing about Spain-Portugal is that whilst I have no doubt that Ronaldo will be scorching opponents all tournament long, Spain are fully capable of throttling almost any side. The Brazil-Germany encounter is much harder to call, although the home crowd will obviously be insane at that point. Third place will again come down to the performance of exceptional individuals (Ronaldo against Germany/Ronaldo vs. Neymar), and there’s no telling how a bitterly disappointed Brazil (should they not make it to the final) would play. Brazil match up better to Spain than Germany do to my mind, and the European option will present a far more manageable obstacle to the Spanish. They still have the best squad (and, to be honest, probably the best eleven as well), with more youth and athleticism than the side which competed in the Confederations Cup last year. This entry was posted in World Cup 2014 and tagged argentina, brazil, brazil 2014, england, football, germany, spain, world cup 2014 by The False Nine. Bookmark the permalink. And there was me assuming everyone was writing off Spain. Brazil will muddle their way to victory in the way big host nations do (see England 1966, West Germany 1974, Argentina 1978 & France 1998).